The chef claimed the food was safe; however, we were skeptical. However, it was extremely wise to take precautions when cockroaches are present. There was no need, however, for the emergency responders. However you look at it, the chef prepared a delicious meal. Here’s the rub with this word: when it’s overused, it can seem condescending or pompous to the reader. Tip: Be real with your readers and feel free to compare/contrast; however, simply ease up on the use of “however” whenever you can to avoid a negatively perceived, “know-it-all” attitude. So let’s go … that’s soooo cool … So you should … I was so pleased at first, but it turned out to be only so-so … You might feel a bit weird, so it’s important to … So there you have it! “So” is the writer’s version of “um” for public speakers. Tip: Much like the excess usage of the word “very,” you can avoid “so” by using more descriptive language (e.g., “I was so wildly pleased”) and eliminating it where it’s not necessary (e.g., “So lLet’s go”). Tip: Get to know the comma intimately by checking out the comma section in the Top Punctuation Howlers PDF punctuation guide here. Wait; Where Are You Going With That Semicolon? Semicolons aren’t too bad; you simply need two independent clauses. … completely filled to the brim. Tip: Revise your work by reading it out loud and weighing the value of each word. For more tips on revising your articles to remove verbiage, visit the Short and Sweet: How to Revise Your Articles blog post by clicking here. Do you have any grammar “driving” tips to share? Besides an overuse of “however,” do you have any other examples of good grammar that may be considered condescending? Can you recall any other redundant phrases that drive you bonkers? Let us know – we’d love to hear from you! Want more grammar tips? Check out the wealth of posts over in our Grammar Tips category. * tjmooney. (2010, August 30). William Shatner. Talks. About. His. Distinctive. Speaking. Style. [Video file]. Retrieved from YouTube. PS: Our Mother’s Day special is in full swing! See why others are saying EzineArticles’ Article Templates work wonders for writer’s block by clicking the banner below to get your FREE 15 Keys to Working at Home Article Templates when you purchase 2 Build Your Own Article Template Packages. That’s a $20.97 savings for 45 original Article Templates! Oh, wow! Another great grammar article! Love the Violation ticket! 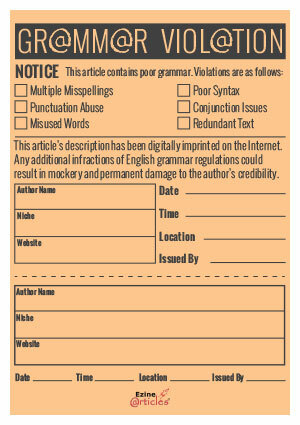 And there’s an idea: when each author has decided what ought to be correct personal grammar, have a pot at your elbow (like a swear box) marked ‘Grammar Violations’. Then, when you proofread and discover one, pop something punitive into the pot. Those ‘violations’ will soon begin to slow down as your wallet lightens, and you’ll have something put by for that fancy foreign vacation! Apart from the five issues raised, Vanessa’s introduction makes the key points. We’re writing for a specific audience in each article (no-one would be stupid enough to think that a single style would be attractive to all English-language readers… would they?) So the style will be pitched to that audience. But there’s nothing like bad grammar to put off anyone who knows how it ought to go. Writes who want to be though ignorant, authoritative or ignorant of their specialty will ignore grammar. But the rest of us would be wise to spell and use grammar at the level of our most well-educated audience. This is not to say that pompous prating will go down well with most people; it won’t. But nor will ignorant use of punctuation, repetitive use of certain words or mis-applying homonyms like ‘you’ and ‘yew’ and ‘ewe’. If I received a letter from a motor engineer about my car’s handling problems, and the English was poor, I’d not mind if he was my local, high-school-drop-out mechanic who’s a whizz with chassis tuning. But I wouldn’t be sure I could trust him if he wrote the same uneducated letter, but claimed to be the maker’s chief technical engineer! Oh, dear: proofreader’s correction coming up and a 1 in the pot! My grammar can be sloppy and it has been easy to convince myself that I am easy going and not bound by rules. Reading your article did not change my attitude toward rules but it did make me think. On reflection, I decided to be more aware of grammar when I write. I did not make this decision to avoid the grammar police, I simply decided to give more respect to my readers and my writing. Why, in your first paragraph, did you write “or a “I write…”” instead of “or AN “I write…” That is wrong, and it is so common now. Even our president does it, but that does not make it correct. After a lot of finger pointing and excuses, you’re either a member of the grammar police or a “I write in the language of my audience – grammar errors and all” rebel. Not actually an error, Connie, Vanessa! The ‘a’ refers to the ‘rebel’ after the quote – we don’t say ‘an rebel’. But for smooth reading, this is one time when breaking the rule is sensible, and not confusing. Which just shows that Grammar Police can be pretty irritating, because they’d spoil a good paragraph for the sake of sticking to rules which are more appropriate to Latin than to English, anyway. The real test is whether the words jar to readers who know their grammar well. Those few pedants who’d cut off their customers to spite their peers aren’t worth listening to. That use of _a_ instead of _an_ is indeed an error, David, because _rebel_ is preceded by an adjectival phrase that begins with a vowel sound, and it is the entire resulting noun phrase, not just the nominative noun alone, that must be taken into consideration when deciding if either _a_ or _an_ should be used as the indefinite article. Since the noun phrase in question begins with _I_, the grammatically correct indefinite article to use with it is _an_. My older grammar books are quite clear that the interjected phrase or clause should not affect the use of ‘a’ and ‘an’. They are written by, or derive from, those infamous Grammar Masters of the 19th century (I was actually given these for ‘advanced work’ at Grammar School in the 1960s). But my trusty ‘English Today’ book 5 by Ronald Ridout sees it your way, and (now I look) so do modern grammars, though the basic ones, like the Bryson’s Dictionary that I keep recommending, don’t mention it. Just shows how a disreputable upbringing tends to stick. So yes, cast out those pedants! Hmm… My contemporary grammar books and style books, including the current sixteenth edition of the revered _Chicago Manual of Style_ (see section 5.72) and _Garner’s Modern American Usage_, all state that when it comes to the indefinite article, the choice of either _a_ or _an_ depends on the sound of the word the article will immediately precede: _a_ goes before words with consonant sounds, and _an_ goes before words with vowel sounds. And this even extends to acronyms and initialisms, say my grammar books, meaning that you would say “an LSAT exam” even though the _L_ in _LSAT_ stands for _law_, which itself would take an _a_ before it. In spite of what your older grammar books tell you, David, the rule I describe above is certainly not new. Not only is it the one I was taught when I was in grade school back in the late sixties and early seventies, but it is also the one professors and grammarians were following when I later earned a BA in English. Yet it’s been around even longer than that. Consider, for example, the Declaration of Independence, which was penned by Thomas Jefferson in 1776. At the end of paragraph two, Jefferson talks about how King George established “an absolute Tyranny over these States.” And as you can see, Jefferson used _an_ before the modifying adjective _absolute_, even though the noun modified, _tyranny_, begins with the consonant sound of a _t_. I do agree with you, Robert. My own usage has always been as you describe as far back as I can remember, not withstanding those ‘advanced grammars’ in the school Library (established 1821) of which I must have taken little note! Those 19th century Schoolmaster petty pedants, based their idiosyncratic work on the old grammars written in Latin and predicated on that language’s rules rather than English usage. Bishop Lowth’s 1894 work did not seem to curb them and my own older teachers believed wholeheartedly in their dictums, despite the work of Fowler & White. I think it’s maybe similar to the ‘split infinitive’ debate; I was taught that splitting infinitives was just plain wrong, with the hint that the genius of famous authors who did this despicable thing might be just a little unstable. Truth is, the rule was invented in its full nastiness by one undistinguished writer in the 18th century, whose inexpensive grammar was nevertheless popular with school teachers in the 19th. This is actually rather like the contested use of ‘x and I’ or ‘x and me’. This applies famously to the English, fuelled by Queen Elizabeth’s 1950s adoption of ‘my husband and I’ to be less formal (and less confusing) than the royal ‘we’ in casual use. The English Middle Classes have, for over a century, been carefully coached to avoid the common (i.e., working class) use of ‘me’ in usage like “Me and me mates went out to the flicks.” which was supposed to be, correctly, “My friends and I perambulated to the cinema to watch a moving picture film.” or similar. This, of course, is to be applied to the subject in a sentence. The error happens because it is also frequently applied to the object, simply to avoid the deprecated use of ‘me’ in any context. So, while they freely say “Give that to me, please”, English people regularly, and incorrectly, say and write “Give those to Julia and I, please.” Teaching English in High School, I had to train teens to take out the other object and see whether the ‘I’ that’s left is correct on its own. They could understand the rule, but they had been so strongly brainwashed by their parents that they could hardly bear to use the correct ‘me’! Is there a similar experience in other parts of the English-speaking world? Violation is sometimes intended also as in your ticket.Without a proper vehicle(Quality Content), evan a skilled driver(grammar) will bot command respect. So driver gets name only when there is a vehicle. With the exception of the punctuation items, the issues you discuss in this article are not matters of grammar but rather matters of style. True, Michael, but Vanessa’s and other people’s comments make it clear that some styles are so irritating to readers that the writer would be well served by learning from the great stylists and making some changes! Hello, everyone. I’d like to quickly submit the issue of ‘begging the question’ when someone means to say a situation raises a bigger issue or raises concerns. It seems these days everyone who wants to sound informed will quickly include “which begs the question”. It is really a case of ignorance in high places, I think. Begging the question, as I learnt somewhere in another life, is a form of fallacy where something claims to be true with no other evidence than the claim itself. For example, my religion is the one true religion. How do I know this is true? Because my ‘holy book’ says so? How do we trust the holy book? Because the holy book says it is the only one we can trust. So someone who means to say ‘this event raises the question’ or ‘bears asking’ now stands very tall and tells us ‘it begs the question’. Thanks, Ubong: that’s a good one. There are so many cases of trivialization like this, which we as good authors ought to resist, but – I suppose – are inevitable and are simply part of an active, lively language. God forbid that we go the way of the French, with their ‘Committee for the Abolition of Un-French Activities’ (the Acadmie franaise) trying to stop French people from changing anything in the language from what it was in the mid-17th century! My father-in-law always deprecated the trivialization of superlatives (he was always banging on about how ‘wonderful’ now simply means ‘good move’ to a football commentator, rather than ‘inspiring a sense of wonder’.) But this has always happened, though more slowly maybe since the advent of comprehensive dictionaries. Can I throw in another one? to ‘decimate’, until the 20th century, meant ‘reduce by a tenth’, as in “the Legion was decimated after the battle with the Goths;” or earlier, “The general ordered the cowardly legion to be decimated, so one in ten were chosen by lot and clubbed to death by their comrades.” That would have been a disaster in either usage. Today, maybe after the effects of two terrible world wars, ‘to decimate’ has been upgraded to ‘so severely reduced in numbers that few are left’. Which usage is better, I wonder? David, I must say I now stand better informed about the ‘decimate’ point. Truly, the word has assumed far more dramatic (and hysterical! )proportions from its origins. I think it’s metamorphosed because the real act of decimation has disappeared. As a result, some inspired writer sometime maybe in the 19th century dusts up the word to describe some carnage in the Battle of St. Tropez (made up) and all of a sudden it’s now back in pop culture as a supercharged version of the factory model. Language certainly doesn’t stand still, though change just for the sake of it isn’t desirable. I do not like grammar much.. If I can connect with my audience without grammar then what is wrong with it? But most of times it does not happen. I have to correct grammatical errors no matter whether i like it or not. Are you serious, Jenny? Not a joke? The whole point of grammar is that it lets you connect with you audience accurately – that is, without misinforming them or leaving them confused. I know that a lot of grammar mistakes (most of them, actually) don’t cause confusion. Even if there are several possible understandings, only one is likely to be the right one in most cases, but getting the grammar wrong has three drawbacks for you. 1) You look ignorant to most of your readers. Did you want that? 2) It’s harder for most people to read stuff that’s full of grammatical mistakes: good readers slow down, poorer ones stumble more and only the worst readers won’t notince any difference. But all of them will avoid you next time – you’ve made life harder for them. David, I once realized how difficult it can be sometimes to understand someone writing (or speaking) very clearly with correct grammar. Then imagine when some mis-arrangement is thrown in and all of a sudden there’s trouble. There’s a politician in my country who carries around lots of big words and invents a good number himself. I sometimes get lost even if some of the grammar is alright. Google up ‘Patrick Obahiagbon’ and let me wish you good luck. Quite right, Ubong. That’s the whole point of using grammar properly. Competent innovators help the language: Shakspere could hardly help inventing new words 400 years ago (over 1600 of them!) Yet 2/3 of his coinings didn’t catch on and aren’t now in use. Most of the rest, though, are so commonly used that we’d be poorer without them. In those days, educated people learned Latin, and often Greek, too, more thoroughly than they learned English. A Grammar School (the only kind then, almost) taught LATIN grammar, not English. New words were often based on those languages and/or the strict grammar rules they used. Shakspere’s new words were immediately clear in meaning to any educated person who heard or read them: majestic, hurry, gloomy and excellent, for example. But he also invented ‘conflux’ and ‘barky’! Neither of these stuck, but it’s fairly obvious what they mean (“The corporal briefed his squad with a barky swagger”). The point is, that language is there to help us communicate with other people. If we use words they don’t understand (do I guess right that most of P.O.’s incomprehensible coinings in English are based on his native tongue, but twisted? ), or are not clear or even plain wrong in our grammar, then people will get fed up with us and simply not listen. Or they will think we mean something we didn’t – and that’s our fault, not theirs. I used to teach teenagers. At 13-15, many of them experiment with a new writing style; that’s OK – as long as other people can read it. I often had to remind them that the whole point of writing is for SOMEONE ELSE to read and understand it. So their new style, like new words or our grammar, should make reading and understanding easier, not harder. Many of these innovating teens weren’t listening. Their experiments were purely to satisfy themselves – not the reader! Do you have any grammar “driving” trips to share? Besides an overuse of “however,” do have any other examples of good grammar that may be considered condescending? “trips”: was this supposed to be “tips”? Are we missing the word “you”? I am only asking for clarification. I tend to also make such mistakes often enough. I’m happy to be a member of EzineArticles. Yes, Lissa. It’s a great tool, doing quite a lot more than Word. From what I’ve been told it’s also based on the old ‘Grammatik-5’ code, but better developed than any others I’ve seen. BUT – it’s very expensive, and too much for me to justify paying for , as it rarely finds a problem that I didn’t spot myself. It is grammar that makes sentences meaningful, and passages readable. Without correct grammar it is difficult to understand the passage or article being read so the proper use of grammar can never be over emphasized. I seem to be writing a lot in these comments, Gracious! You make a good point. In ordinary use, and especially speaking face-to-face, people are very careless about grammar – because intonation and gesture can speak as loudly as words, and this makes mistaken understanding less likely. Also, people who know each other well and share the same non-standard use of grammar and idiom, can understand each other well anyway. Face-to-face, corrections to misunderstandings are much easier to make. In general, because writing is such a difficult skill, people understand grammar much better than they can write it themselves. So they can spot mistakes they make themselves and spot incorrect grammar even when they’d never write in that way themselves – and judge us by it. To ignore grammar, or use only a minimum or an unorthodox form, does not usually cause misunderstanding. If we remember that the use of punctuation is quite a recent thing, gradually expanding to help with reading clarity, the point is that people could understand written work even when there was no grammar; it was just harder and more liable to misunderstanding. So, for us as EzineArticles writers, what is there to learn? That to get our message across best to the readers we want to reach, we need to use the best grammar we can within the writing style we choose. Our readers are good at understanding the message we give them and will judge us partly by the quality of our grammar. If we are careless or bad at writing and grammar, what we are telling them? Is that what we want? David, naturally we can look to your own writing and see just how well we follow your points and the influence your grammar certainly has on that. You’d think that everyone would want to be as clear and as precise in their expressions as you hope. Apparently not! Otherwise all the crimes occuring in the name of phone text messages, emails and posts on social networks would never exist. Just like you said, it is a lot easier to understand someone in face-to-face situations than it is in writing. I know how many times I’ve encountered conflicts with others even from writing supposedly humorous things (some people get it, some don’t, others don’t even care). After observing it for a few years I resolved to be un-bending in writing as clearly as possible-that means SMS, posts, e-mails, chatrooms; whatever the medium is I write, punctuate and reduce abbreviations to near zero. I wonder how many will read your last post and even come close to understanding just a tiny bit of the need to write properly. I predict about 6% will. Thank you, Ubong. I agree with you. Yet we do have to leave space for changes in the language. Casual usage in SMS, tweets, etc.do tend to ignore capitalization and most of the grammar rules – but they are still intelligible, so they serve their purpose fine. I’d imagine that over time, conventions which grew up in these communication methods will filter into the ‘standard’ language, with hiccups along the way as writers try out different idioms and they are either accepted or not. These new usages have a lot in common with formal shorthand systems like Pitman Shorthand, but because they are closer to standard English, they are more likely to influence it. I am perfectly happy with changes in the grammar ‘rules’ (usages) provided that these changes don’t lead to confusion. Those were really nice tips.The one that I want to share is , “Avoid writing Long Sentences”. Such sentences bore out the reader and they just close the TAB instead of reading further.So try to break sentences as shorter as possible. It’s quite valuable posting for me whose English is a foreign language. Thanks. Make the sentences with different and new words it makes reader’s interest in the article. What’s the correct plural of faux pas, that’s what I want to know. The plural form of the word faux pas is faux pas. :) This is an example of a noun that has an identical singular and plural form.